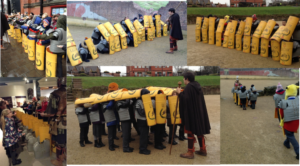 Class 3 and 4’s Roman trip to Chester! Class 3 and 4 have had a jam-packed, fantastic day today exploring and learning all about the Romans and their history in Chester! From walking to the Amphitheatre dressed in armour with shields, to practising battle formations, and looking at and using Roman tools, we have thoroughly enjoyed our time in Chester, and have learnt a lot! This entry was posted in Class 3 News, Class 4 News by Miss Howell.